We had been noticing that we were sleeping longer in Ireland than we do normally. It’s rare that one of us isn’t awake by 6:00 a.m. when we’re at home, but since we were on vacation, our bodies must have much have intuitively known that there was no need to get up early and so we found ourselves sleeping until 8:00 a.m., or even a little later. It felt good to get the extra rest. We awoke on Tuesday with a light schedule, knowing it would be our last full day in Tubrid because on Wednesday we’d be heading up to Dublin. We planned to stay at an airport hotel on Wednesday because our flight left very early in the morning on Thursday at 7:00 a.m.
As I mentioned in a previous posting to the weblog, my cousin Kathleen was visiting Ireland at the same time we were there, having made a decision to accompany her husband on a business trip to the UK and then on to Sicily. Kathleen was born and grew up in Ireland, but moved to the U.S. before she had learned to drive. So she had virtually no experience driving in Ireland and had somehow managed to avoid it despite having visited Ireland quite frequently over the past 30 years. Driving in Ireland requires a driver to do many unnatural things, such as sitting in the passenger seat of the car, where, strangely enough, they put the steering wheel along with the gas and brake pedals. They also rent primarily stick-shift cars, something you’d almost never find in the U.S. for rent. If you want an automatic shift car in Ireland, it generally means you’re going to pay 3 times the cost of the economy car rental fee. You also have to learn to shift with your left hand…during the 1 minute span it takes to get the car out of the parking lot. The hardest part, of course, is learning, after many decades of doing otherwise, to drive on the left hand side of the road. If you’re lucky, you’ll have a passenger who will manage the navigation and yell at you when you forget to keep to the left. The coup de grace to driving in Ireland are the roundabouts. The roundabouts will keep you from losing focus on your driving. Each one is a new experience in learning the rules of right-of-way, merging, yielding and reading exit signs all while keeping your head on a swivel. But if you get confused, you can always stay on the inside lane and circle around until you get your bearings. Kathleen was arriving alone and so she decided to rent a car at the airport and, for the first time in her life, she would drive in Ireland. 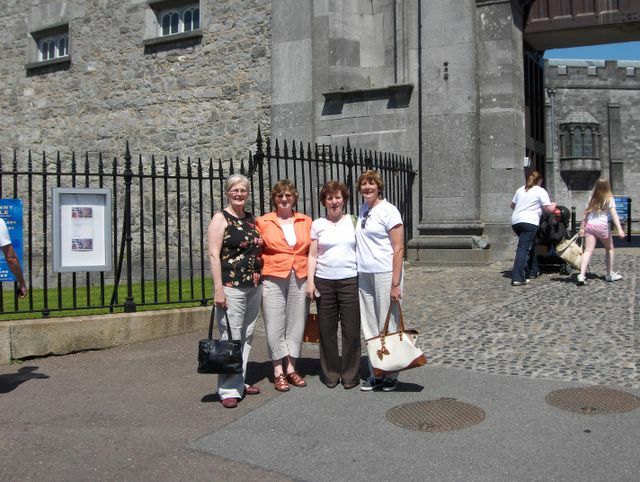 We had missed her arrival by a day while we were in Nenagh, but she was able to catch up with us in Kilkenny. We had arranged to meet with Kathleen and my other cousins Lil and Theresa for lunch at the Kilkenny Design Centre, across the street from the Kilkenny Castle. The Kilkenny Design Centre is a collection of artists’ shops and a retail store with a restaurant/cafeteria on the second floor. It’s quite nice, but can get expensive if you hang around it too long because there are so many nice things you can buy there. Kathleen was the first relative I remember meeting from my Aunt Bridie’s family. She stayed with us for about a week when I was very young, about 6 years old and I recall that my sister and I quickly became attached to her, hoping she’d continue to live with us like a big sister. After moving to the U.S., Kathleen settled in Seattle and so we didn’t get to see her like we did my other Irish relatives who lived in and around New York. Eventually, I went off to college and later moved to Colorado and when she visited my mother in Pennsylvania, I was at school or in Colorado, so it was more than 30 years before we got to meet again. Terri and I went to her son’s wedding in Seattle in 2004, flying the LongEZ up from Colorado. We stayed in downtown Seattle for about 5 days and got to see many things while we were there and spent some time with Kathleen and my other relatives including Kathleen’s brother John and his wife Ann and her brother Tom who flew in from Ireland. We also met her husband, Bob, and her children, Andrew (the groom) and Katie for the first time. I saw her again in 2005 during a business trip to Seattle. Now I’ve been able to see her each year for the past 3 years, a trend I hope will continue. After the 30 year gap, we obviously have a lot of catching up to do. Because of the logistics of arranging the schedules, we didn’t eat lunch until about 2 p.m.. We had a great time visiting and before we knew it, it was time to head back to Tubrid. Later that evening we were scheduled to have dinner with my cousin, Eileen and her husband Willy and her children. After leaving Kilkenny, we headed back to Tubrid and gave Eileen a call to let her know we’d be a little bit late. Theresa offered to follow us so we wouldn’t get lost and we were glad for the help, because the roads in Ireland aren’t the easiest to navigate. We did make a wrong turn at a ‘Y’ in the road which to us looked more like a ‘T’ but were able to recover thanks to Theresa’s supervision. We knew we’d be coming back in the dark, so we had to keep looking for landmarks that would help us return without assistance. On my mother’s side of the family, I have 10 first cousins and between them all, they have 28 children. These are my first cousins, once removed. Many of them live in Ireland. We had met some of them for the first time in 2003, and on this trip we got to meet a few more. There are still a few that I’ve never met. During dinner, I got to meet Eileen’s daughter, Louisa, who lives nearby and her son Eric who lives in Florence, Italy most of the time and works as a mechanic for a major airline. He comes back to Ireland quite frequently. We also got to see her sons William and John again. We had a very nice dinner and afterwards we took a quick tour of the Kilkooley estate. Louisa lives in a guest house inside Kilcooley, a beautiful 2,000 acre estate surrounded by a tall stone wall. The wall was built during the potato famine for subsistence wages to keep people from starving. The Kilcooley land owners sold personal items such as jewelry and silver to raise money and created a kind of work program for the poor to have a wall built around Kilcooley. There are a number of famine walls around Ireland. 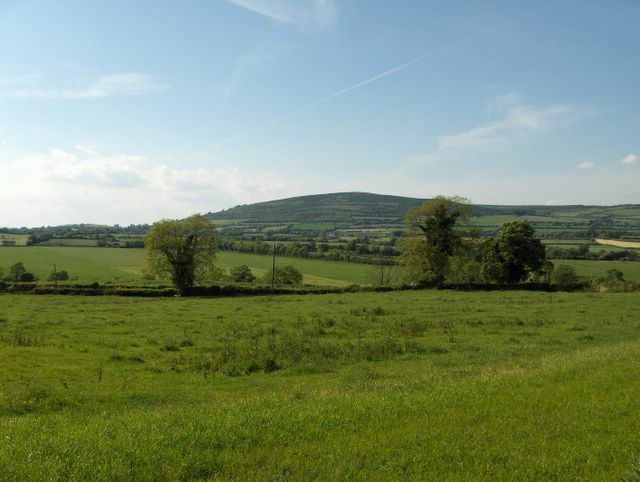 The Kilcooley wall is 5 miles long and is reportedly the longest famine wall in Ireland. I’ve found that the term ‘famine wall’ also refers to a public work scheme that was intended to build unnecessary structures just so that the poor had to work for sustenance and not be given charity, and I’ve seen a few pictures of walls that fit that description. But the Kilcooley wall is not one of them since it was privately funded and does serve a purpose. Although it was getting late, around 9:30 p.m., there was still enough daylight left to get an impromptu tour of the estate which Louisa and her boyfriend generously arranged for us. The estate includes a wide variety of landscapes. There are thickly forested areas along with pasture land, areas dedicated to equestrian activities, a 10-acre lake, and a huge Georgian mansion built in 1770. The land has been in the same family for nearly 400 years and now, for the first time ever, is for sale. 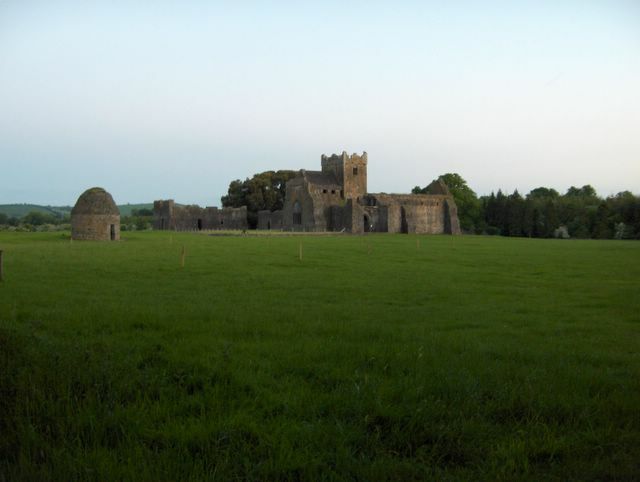 The most interesting part for us was a Cistercian Abbey known as Kilcooley Abbey which dates back to the 12th century. The current structure was built in 1450 after the previous one was destroyed by fire. There was something surreal about walking out from a canopy of thickly forested land into a wide expanse of pasture with this imposing medieval structure off in the distance. Despite the time of day, or perhaps because of it, there was an aura of other-worldiness about it. Louisa intentionally failed to mention its dramatic effect just so she could see the expressions of awe on our faces as we first gazed at the abbey. We wandered around inside the abbey and took some pictures before it became too dark. We’d love to go back to Kilcooley and spend some more time exploring around the grounds. Later we went back to bid our farewells to Eileen and her family and then headed over to the Cradog, where we’d spend the night with Lil and Frank. Around the time we left, my cousin Paddy was calling from New York and Eileen went in to take the call. No sooner did we arrived at Lil’s place did Paddy call there too and so we got a chance to speak with him which was very nice.